It’s one thing to find the Earth&apos;s axis obliquity angle of 23.5º for the first time within the geometrical structure of the Great Pyramid of Giza - one of the most mysterious and famous buildings in the world. But to find this same angle having been deliberately encoded over and over again in various works of art; for example, paintings by many of the leading artists in history, also sculptures, architecture, symbolic imagery – both ancient and contemporary – is quite staggering. One could and would argue that according to the ‘law of averages’, this angle is sure to appear in many paintings and as frequently as all the other angles we can extract from a 360º circle. However, the truth is that the paintings or sources myself and others have analysed, are all associated by theme and also contain deliberately planned, conspicuous, linear items and features that are just "begging" to be measured so one can obtain the angles being presented. I should also mention that while conducting my research and analysis of these paintings, I have also purchased full-size prints of many of these same paintings to avoid any re-sizing, scaling discrepancies or computer-monitor distortion effects one finds when measuring the angles in images taken from the Internet using computer software. On re-checking these sources, I have found most of these angle references to be accurate and precise. Also, for the sake of balancing the argument and to try to prove myself wrong, I also looked into the fact that the close angle of 22.5 degrees is a common angle used in art for perspective, as 22.5º is one sixteenth of a 360º circle. I mention this so that others would be aware of this, and so test this themselves. I have now examined many paintings, and have found that although some of the overall ‘perspective features’ in some paintings are in the ‘right ball-park’ and could therefore be associated with the 22.5º angle of perspective so as to support this given fact, I have found that many suspect features, such as columns, pillars, staffs, poles, flagpoles, sceptres, spears, lances, pikes, clubs, bones, limbs, swords, knives and other linear, sharp and rectangular objects, to be conspicuously and definitely at the angle of 23.5º, and in some cases 23º – which is most evident in the earliest sources. We find this with certain linear items or features in well-known Masonic symbols and esoteric symbolism – and especially those in highly symbolic paintings portraying mystical or religious themes. Furthermore; although very close, the angle of 23.5º is not mentioned as having anything to do with the common angles of perspective, so the many references to this angle must mean something else – and for the time being, for me, the present obliquity (tilt) of the Earth’s axis of rotation is the main contender. This is all the more evident when we discover this angle in the earliest sources. For example, we find the ‘round value’ angle of 23 degrees evident in ancient Egyptian art – especially illustrations or wall-relief scenes that feature the Djed Column or Djed Pillar. The ancient Egyptian ceremony known as the “Raising of the Djed Pillar”, in which the reigning Pharaoh took part, has long been considered a festival associated with fertility, rebirth, resurrection and renewal. It is obvious that the Djed column or pillar itself was a symbol of strength, stability and power; but there has been much debate about what it truly symbolised as well as its symbolic or practical function. According to Egyptologist A. E. Wallis Budge (1857–1934), the Djed, tet, tat, didu, ta-wer (where we possibly derive the word ‘Tower’), was the oldest symbol associated with the ancient Egyptian &apos;resurrection god&apos; Osiris, and it was Budge who popularised the idea that the Djed symbolised the body of Osiris and more specifically his backbone or spine. The myth of Osiris tells us that he was murdered by his evil brother Seth or Set and made “god of the Underworld”. He was also the god of vegetation, grain and wheat, for it was believed that the winter season, when everything died and stopped growing, was associated with the death of Osiris. So to bring balance and stability to the Earth and ensure the harvest, it was believed that Osiris be brought back to life; resurrected, and this was ritualised by the Djed pillar being raised up straight – his backbone represented by the Djed. The phallic connotations associated with fertility and the creation and abundance of life are also obvious, but there is more to the Djed than the mere display of male potency and power. As if to support these views, it has been determined and presented in other textual sources that the tilt angle of the Djed shown below in the relief from the Temple of Abydos, is in fact very close to 23º and so also appears to be a very early reference to the tilt angle of the Earth and the obliquity of its celestial pole or axis. Figure 1: Ancient Egyptian wall reliefs from the Temple at Abydos. c. 1300 BC. B. (Right:) In the next image in the sequence, the Djed is standing up straight, erect. UPDATE: 8th December 2013: See this page, Conspiratorium by David T. Hill. York Rite Masonry. There are also numerous Djed images at the Temple of Hathor at Dendera, most of which are leaning at the angle of 23 degrees. “In the case of the Djed column, the Egyptians came remarkably close to symbolising the abstract idea of a simple Earth axis. Some would say they obviously achieved it. The Egyptians represented their cosmic and religious beliefs with symbols modelled after material forms in order to assist in the expression of abstract concepts. Cities and places in higher realms were fashioned after counterparts on Earth; a man&apos;s soul was depicted as a bird; and the symbol of life-giving energy was the ankh. There are many sources suggesting that this symbolic stylised column reflects the fact of the Earth&apos;s rotation and that it actually represents the abstract idea of a simple Earth axis. The transparent symbolism of the Djed as a pillar which even looks like it is spinning testifies that their concept of an axis was very similar to ours”. William Fix also brings attention to the fact that the northern constellations depicted on the ceiling of the Ramesseum at Thebes (mortuary temple of Pharaoh Ramesses II), are “positioned directly above a Djed column, which is itself in the centre of the northern register of the ceiling – still another illustration of the Djed as the axis or pole”. One would have to agree with this view also and conclude that the Djed symbolised both the human (backbone) axis, as well as the Earth&apos;s axis. From what we can gather based on the symbolic imagery that surrounds the Djed, it appears that both symbolised a belief in a direct vertical connection – a vertical line or "path of energy" that connects us and the Earth with the spiritual Source-Centre, represented by the still point (ecliptic centre) in heaven around which the stars in the northern sky were seen to move and revolve as a result of the Earth&apos;s tilted axis. This is possibly why we have the ritual of the tilted Djed being lifted upright as this vertical placement symbolised the ideal upright connection that each of us has with the Source – a connection that seems to have been broken in the past – again, as reflected in the Earth&apos;s tilted axis. This connection between the tilted Djed (backbone of Osiris) and the tilted Earth, and the apparent belief that both should be upright, is quite convincing the more we research into it. As R. T. Rundle Clark, former professor of Egyptology at Manchester University observed, the Djed pillars were meant to support the sky. “The purpose is clear: . . . the djed columns are world pillars, holding up the sky and so guaranteeing the space of air and world in which the king’s authority holds good”. (My Italics). To illustrate this, in the following image, we see the arc of the sky being held up by a series of Djed pillars. Figure 2: Djed pillars in blue-green turquoise, holding up the sky. Detail of a panel from one of the walls in one of the galleries underneath the Step Pyramid of Djoser (Zoser) at Saqqara. Why did the ancient Egyptians devise such a concept? Why was it deemed necessary for these people to reassure themselves that the sky was held up by pillars? And why was there a ritual or ceremony known as the “Raising of the Djed Pillar” in which a pillar was raised upright from a tilted position? Did the sky “fall” in the distant past which would suggest a dramatic axial shift? Did the stars suddenly move out of place? Is this why it was believed that the sky needed to be held up with pillars? Its interesting that the turquoise, bluish-green colours in the image above are also associated with the Ancient Egyptian colours of resurrection, rebirth and regeneration. However the above image with the arc of the sky being supported, shows that the Djed was also a symbol associated with the resurrection and stability of the Earth, which would suggest the belief that with the resurrection of Osiris – as ritualised in the raising of the Djed from its 23-degree tilt to upright as shown in the Abydos reliefs – that there was a collective desire to also raise the Earth to an upright position, and that this desire was based on the belief that the Earth should be upright. It&apos;s also probable that this belief is based on an archaic, collective memory relating to the fact that the Earth was indeed once upright in the far distant past. I will be addressing these beliefs and more in other presentations on this site. “Frank C Higgins, a well-known Masonic symbolist, has astutely noted that the ornate headgears of certain gods and Pharaohs are inclined backwards at the same angle as the Earth’s axis”. Indeed many depictions of Osiris in profile show his Atef crown angled at 23 or 23+ degrees, and we find that the crown worn by Seti I in the wall relief above is orientated at 23 degrees. As we can see the crowns are made to lean back at this angle with the head held perfectly straight. Figure 3: The Atef crown of Osiris at 23 degrees. The Flail is also at this angle, as is the beard and the sides of the upper arms, forming a 47-degree arch . . . 2 x 23.5º = 47º. Detail from the Papyrus of the Scribe Hunefer. “The Judgement Scene” 19th Dynasty. (British Museum). My attention was first drawn to the late Frank C. Higgins by a fellow researcher who had noted my research into these angles. Higgins, an American traveller/explorer, 32nd-degree Mason and field archaeologist, is virtually unknown outside the world of Freemasonry and not much is known about him, but his collection of works written at the beginning of the last century about Freemasonry and the ancient sources that have largely inspired Masonic thought, are a remarkable resource of information. “It is true that Freemasonry is the parent of all religion, the original world-wide cosmic gnosis, diffused in ancient time to the uppermost ends of the Earth. Freemasonry is the Pompeii of prehistoric science. All the Masonic ritual, its Egyptian signs, its Chaldean grips, its Sanskrit passwords, its ancient Hebrew symbols, its cabalistic allusions and its historical records are supremely scientific and a survival through long ages, by various underground channels, of the knowledge of the universe which was gained by Sabean astronomers from the temple tops of Chaldea, India and China and recorded by the equally learned geometers and mathematicians of the ancient Orient”. “In this field Brother Higgins is a master, and comes nearer than anyone With whose work we are acquainted, making the treasures of that rich but difficult culture intelligible to the average reader”. By all accounts Higgins’ work was and still is, revered and respected, and considered a tremendously informative resource for those researching the origins of Freemasonry. But what interested me on first viewing his book, is that Higgins made numerous comments about the angle of 23.5° and 47° (2 x 23.5°), and all within the context of his travelogues, citing the earliest Masonic sources of knowledge, which included ancient Egypt, Mesopotamia, India, China and the Americas, extending also to the Gothic architecture of Medieval Europe. Higgins’ books contain a wealth of information – an extraordinary and unique insight into the wisdom and knowledge of these ancient cultures, which as far as I know, have not been published elsewhere. More importantly for me, the numerous examples he presents as regards these ancient references to the present obliquity angle of the Earth, supports my own view that the same angle references I have found in many sources, especially paintings from the 17th century, were deliberately encoded and for good reason. In his book, Higgins mentions another ancient source that includes a reference to the Earth’s obliquity angle. This is the bas-relief from the celebrated diorite stele, known as the Hammurabi Stele, (c. 1792–1750 BCE), which includes a transcript of the ‘Code of Laws’ of king Hammurabi. The stele was discovered in 1901 at Susa in Iran by a French archaeological expedition led by M. J. de Morgan. The bas-relief shows Hammurabi receiving the ‘Code of Laws’ from the Sun god Shamash “ . . . whose robe is an angle of 66½ degrees, or the inclination at which the Earth’s axis crosses the plane of the ecliptic”, writes Higgins. Higgins also states that the individual often referred to as the “sun god Shamash” in this Stele, is really King Solomon and that Hammurabi who is being commissioned by Solomon, is none other than Huram Abi – Hiram Abiff, the chief architect of Solomon’s Temple. Hiram Abiff, the ‘Master Mason’ who is considered something of an icon by Freemasons and who has even been compared to Jesus, is mentioned in the Bible, (second Chronicles, Chapter 2, 12–13). Higgins states that the precepts or laws of Hammurabi “are all of a truly Masonic character”, leading us to assume that the Masonic principles are based on these same laws. This is a truly fascinating association and one that would no doubt be disputed by many mainstream historians, but Higgins being a 32nd-degree Mason I am both prepared and compelled to take Higgins at his word. Figure 5: Bas-relief from the Hammurabi Stele, (c. 1792-1750 BCE), now on display in the Louvre. Higgins writes that the angle is 66½ degrees, which is the inverse of 23.5 degrees – 90° – 66.5° = 23.5°. See subchapter, Four Orientations of the Same Angle below. Higgins may have been the first and only person who commented on these 23.5-degree references at the time, but since 2000, when I first stumbled upon them, I have discovered hundreds. The astonishing rate of recurrence as regards these references made to the obliquity angle of the Earth’s axis is a real mystery; a phenomenon that is only now being uncovered and researched. Others who know about my research have discovered many of these references themselves and have sent me images of their finds. It is truly a major phenomenon; one that has largely gone unnoticed for centuries by the public – especially by art experts and historians – and it is one that must surely have a fascinating answer or explanation. As to the motive, well this is still largely a mystery and remains an ‘unknown’ at present. However, I would emphasise that these references have led me and others to make some remarkable additional discoveries and these results have led me to develop my own interpretation as to what these references may be pointing to. This will become evident as we go on, although several varying scenarios will also be touched on and discussed in the presentations on this website. I will also be quoting Higgins extensively throughout, as his written observations have inspired me to look again at certain themes in my own research, helping me to see more clearly the very ‘principle’ that binds each together into a more ‘holistic picture’. As we will discover, it is this principle which explains much of the mystery surrounding Giza and the Great Pyramid. Let’s examine a few more of these ancient sources that contain this angle . . .
Below is an ancient Persian image of the god Zurvan (meaning ‘Time’) dating from the 6th to the 4th centuries BCE. Like the Sphinx of Giza, Zurvan is a composite of Lion (Leo) and Man (Aquarius), although unlike the Sphinx, which has a lion&apos;s body and head of a man, Zurvan has a man&apos;s body and the head of a lion - a kind of reversed version. Zurvan is depicted holding the head of a snake or serpent which is wrapped tightly around his body and is standing on a sphere – the Earth; its two diagonal bands referencing the four colures, or four Zodiac Ages in the Precessional Cycle; Leo, Taurus, Aquarius, Scorpio. In his other hand he holds a staff or sceptre at 23 degrees – an early reference to the tilt angle of the Earth&apos;s axis. Again, with some exceptions, this all-round angle value is what we would also expect to find from these earlier periods. While discussing the Masonic Keystone, a theme we will come to later, Higgins includes a sketch of the ‘Lion Gate of Mycenae’ (c. 1250 BC) – indicating that the sides of the carved ‘keystone’ above the open ‘gateway’ and which features two lionesses flanking a central column, are also at the angle of 23.5 degrees. “Greek architecture from the earliest Mycenaen and Trojan periods is based on the same sacred and hieratic proportions as the Egyptian, although the selection of salient angles is different. The Mycenaen pointed arch, such as is found in the famous &apos;Treasure House of Atraeus&apos; and surmounting the celebrated &apos;gate of the lions,&apos; represents the cosmic cone of 47 degrees. In the latter monument the column representing the pole of the ecliptic, flanked by the solstitial lions, almost speaks for itself. Figure 7: The entrance to the Treasury of of Atraeus. The sides of the pointed arch above the entrance are 23.5 degrees to make an arch that reflects the 47-degree "Cosmic Cone", according to Higgins. Figure 8: The Keystone of the &apos;Gate of the Lions&apos; - the main entrance to the citadel of Mycenae, said to be the oldest monumental relief in Europe, (c. 1240 BCE), which encodes the "cosmic angles" of 23.5 degrees, and together 47 degrees, as if referencing the "cosmic cone" of Precession, according to Higgins. The lions flank the central pillar which as Higgins informs us, represents the vertical &apos;Pole of the Ecliptic&apos;. Left: photo attributed to Rokaszil. Right: image attributed to AllMare. Below is a diagram of the Earth at the two Solstice positions of the Sun by Higgins which appears on page 51 of his book Ancient Freemasonry. This is basically the same picture that has been encoded in numerous sources as exampled by the images above, which use two 23.5-degree angles to make an arch. Again, the central pillar flanked by the "Solstitial Lions" is the Pole of the Ecliptic - also symbolised by the upright Djed column associated with the ancient Egyptian god Osiris - said to also symbolise his spinal column . . . the Axis of God. Figure 9: Diagram by Frank C. Higgins from page 51 of Ancient Freemasonry (1919). “Representatives of the pole of the ecliptic or the axis of our earth at angles adjacent to them of 23½, 66½, 47 and 113½ degrees are found in almost all representations of the Olympian gods, and these proportions are Masonic, as embodying the geometric secrets of nature in art and architecture”. What exactly the cryptic “bridal chamber” is, is something I will explain later. Also, the Masonic symbolism of the ‘seven stars’ (also known as the"Seven Rishes" - Hindu), is often interpreted as the seven stars of Ursa Major, (the Great Bear), and then later the Pleiades constellation, known as the "Seven Sisters"; when in fact according to very ancient sources, the ‘seven stars‘ symbolism has its origin in the Seven Polestars associated with the Precessional Cycle. Higgins was surely aware of this, having placed six additional stars in an elliptical circle (representing the precessional cycle) surrounding the seventh - being Polaris, the present Pole Star. This is an important detail we will also examine later. Ancient knowledge of the geophysical condition of the Earth has also been encoded within the &apos;Masonic Square and Compass&apos; symbol, and armed with this knowledge by having first examined the numerous examples that exist in these ancient sources - some of which have been presented above - the hidden meaning becomes transparent . . . Figure 10: Two ways we can view the Masonic Square and Compass to reveal the hidden, encoded geophysical knowledge of the Earth and Precession. Surprisingly, the angle of both 23° and 23.5º also appear in many medieval paintings and illustrations – especially those based on the macabre Dance of Death; a popular theme after the plagues that swept through Europe during the 14th century. Figure 11: Detail from Tallinn’s The Dance of Death. In the painting above we see a preacher, delivering a moral lecture or sermon about salvation and on behalf of the ‘Angel of Death’ . . . that, “those who are reluctant to join in the dance have not prepared themselves in time and to avoid it should rid themselves of sin so as to enter heaven”. It is true that in some cases, the angles of some of the more ‘curvilinear’ features – for example the limbs in the painting above – can be both precise and not so precise; but here I am quite prepared to allow some tolerance to those things that may require it and I ask that the reader base his or her own assessments of this on good common sense, realistic perception and balance of mind. A sceptical approach is always healthy and essential, however, there will always be the doubters, “nay-sayers” and pseudoskeptic debunkers who will nit-pick each detail to perhaps disable or “disprove” a case – especially in the presentation of new research or new discoveries – and one is inclined to question their own motives; but anyone with a balanced perception and an ounce of common sense can easily see that there is an obvious pattern of uniformity here which shows the painter intended each limb to be at this angle. I also discovered that in many of these illustrations depicting the ‘dancing dead’, the instruments of the musician leading the dance are almost always at the angle of 23° or 23.5°. The consistency of this alone is impressive enough to suggest there is a code of meaning here known only to those who can read it. In the example below we see a corpse leading the dance with a pipe and drum each at this angle exactly and each angle perpendicular to the other creating a tilted cross like we see with the polar axis and equatorial plane in many geophysical diagrams of the Earth. Another fine example of his theme of a wind instrument being played at the angle of 23.5° can be seen in The Dance of Death (1493) by Michael Wolgemut. The theme of ‘death’ is a common one with this angle. I have also discovered this angle and the angle of 23° in paintings on the themes of conflict, combat and war, where weapons like staves, pikes, swords, lances, muskets and rifles have all been painted at these same angles. See here . . . Knights in Battle ("Plate from an 18th century English history about the European Middle Ages and Renaissance") . . . to give just one example. At this point I should explain that there are always four ways we can apply the same angle in a 360° circle – the plotted lines of which (and depending on the orientation of the angle) can appear like an eight-pointed or twelve-pointed star. These four ways are both sides of the horizontal and both sides of the vertical, and as we can see in Tallinn’s The Dance of Death shown above (figure 8), the painter has used all four orientations of the same angle for the limbs of the dead. Furthermore, in our 360-degree system, angles are read ‘anti-clockwise’ – the same direction that the Earth rotates – from the 0° starting position all the way round and back to the same zero point which also has the value of 360°. This means that used and read formally, the same angle which appears eight times in a 360° circle, will have a different value as we read each one from 0° to 360°. We will often use a half-circle, protractor to measure or plot an angle, as this is really all we need and really because all the angles in the circle appear in the first 90 degrees known as ‘acute angles’. It should be noted that protractors, based on the 360-degree measuring system have been around since ancient times, but that the initial motivation behind using the &apos;degree&apos; as a unit of rotation for angles is not known. As revealed in our book The Giza Prophecy, co-author Scott Creighton and I discovered that the degree values of the geophysical angles that exist within the cross-section geometry of the Great Pyramid - which I personally discovered in 2001 - are actually reflected in the same number of external course layers from the base of the pyramid to the floor of its internal chambers. These findings, along with other evidence we have found, means there is now ample evidence to suggest that the ancient Egyptians, or whoever had planned and built it, also had adept knowledge of the 360° measuring system. The angle of 23.5° is explicitly referenced in many of the religious paintings from the 15th to 18th centuries – especially in scenes depicting the stories of the Bible, the Gospels and the Crucifixion. The angle is especially recurrent in the many paintings of Christ carrying the cross – a theme we will also examine more closely in the following chapters. Like the Djed of Osiris, which was raised from a tilted position – shown as 23° in the image from the Temple of Abydos – we find many paintings of Jesus carrying the tilted cross at the angle of 23° and 23.5°. Below are just a few examples of many - some by prominent artists such as Caravaggio and Bosch. Figure 14: Left: Detail from Christ Carrying the Cross. Hieronymus Bosch. (1485–1490). Right: Christ Carrying the Cross. (1605). Michelangelo Merisi da Caravaggio. Like Osiris and the Djed, Jesus is later erected upon this cross (axis mundi) to be raised up to a vertical position so as to enter the ‘Kingdom of Heaven’. Surely we can see an emerging pattern of belief here that has remained virtually unknown for centuries; a belief that unites the pagan god Osiris and Jesus Christ together with the tilt of the Earth’s axis. It does appear that the tilt of the Earth is primarily associated in some way with the earliest religious beliefs which also appear to be shamanic in origin. This is no doubt an important element many of us have missed, and one that forces us to think again about the original purpose behind the whole ‘messiah mythos’, which is both archaic and universal and appears to have some connotation with the ‘imbalanced’ condition of the Earth as a result of it being tilted away from the ecliptic. In the painting Christ Carrying the Cross by Bernardino Luini (1520), the shaft of the cross is at 23.5° exactly – as are the shafts of the crosses in paintings bearing the same title by Andrea Solario (c. 1510), and Giovanni Pietro Rizzoli, “Giampetrino”, (c. 1510-30). These angles also appear in various paintings featuring the Four Horsemen of the Apocalypse, (a theme from the ‘Book of Revelation’ and part of the New Testament in the Bible), as if telling us that the ‘Apocalypse’ is in some way associated with the geophysical condition of the Earth and again, the obliquity of its axis. 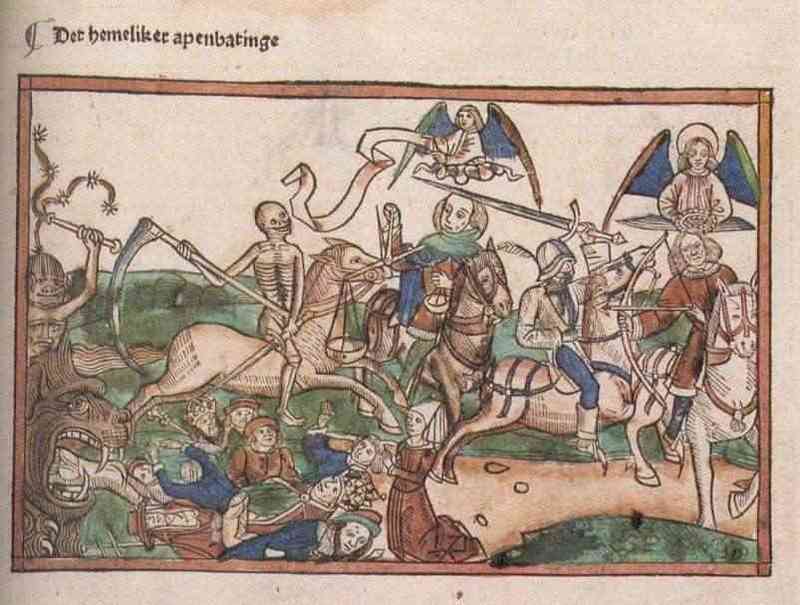 For example, in a medieval illustration from 1479 titled, Der Hemeliker Apenbaringe, “The Four Apocalyptic Horsemen”, the balance scales are at the exact angle of 23.5° as is the handle of a flail held up by a demon about to strike. Another significant 23° angle theme is The Mass of St Gregory. Gregory the Great was a 6th century Pope who, while celebrating mass in the Church of Santa Croce (The Holy Cross) in Rome, is said to have had a vision of the crucified Christ surrounded by the Instruments of the Passion. Gregory’s vision became a popular subject in medieval art. However in many of these medieval paintings Jesus is depicted as twisted and deformed – his torso, head and many of his limbs at the different orientations of 23.5º. Figure 15: Left: Christ Carrying the Cross. by Bernardino Luini (1520). Centre: Christ Carrying the Cross by Andrea Solario (c. 1510). Painting on view at the Musée des beaux-arts d&apos;Orléans. Note that the Angel is pointing straight upwards while the blade of the knife is at 23.5°. This vertical pointing upwards, downwards and also horizontal, as if referencing zero obliquity while an object or finger is also pointing at the present obliquity angle of the Earth, is another recurring theme as we will see. The lay of the land and the trees, as in many paintings – especially those by 17th century artist Nicolas Poussin, who also features prominently in this mystery – are again leaning at the angle of 23.5°. (c. 1465-1470), is at the exact angle of 23.5°. Catherine was highly educated in philosophy and theology and was condemned to death by being ‘broken on the wheel’ for stating her beliefs. Apparently the wheel broke when she touched it and so she was beheaded instead. Catherine is said to be the patron saint of the Sinclairs of Rosslyn Chapel fame; a family who have been associated with the Knights Templar . . . which leads us onto the next source of our enquiry. Figure 17: Left: Early Byzantine depiction of Catherine of Alexandria. (Copyright: St. Isaac of Syria Skete). Below are two medieval-era images of the official Seal of the Order of the Knights Templar. The Seal shows two knights (Hugh de Payens and Godefroi Sant Omer) on one horse – said to be a symbol of their early poverty. The text is in Greek and Latin characters, SIGILLUM MILITUM XPISTI: followed by a cross – meaning “the Seal of the Soldiers of Christ”. The Order was established in 1128 and these Seals date from around 1158, but as we can see the knight’s lances are angled at close to 23 degrees, something that has generally escaped everyone’s notice until now. Figure 18: Two images of the Knights Templar Seal dating from 1158. While on the subject, it has been acknowledged by scholars that the ‘XP’ in XPisti is a reference to the Chi-Rho symbol of Christ. “Although the phrase is written using the Latin alphabet, the first two letters of Christ’s name are the Greek XP (Chi Rho) rather than the Latin CHR. I believe this is unlikely to be a mistake, since anyone who knew enough Latin to write SIGILLUM MILITUM XPISTI correctly, would know to write using the Roman alphabet. I submit that this is not a simple spelling error, made out of ignorance”. The Templar Cross Pattée, the St John Cross – often referred to as the Maltese Cross, an emblem of the Order of the Knights of Malta – all have basically the same design. What is not known is that like the symbolic device of the Square and Compass of the Freemasons, this type of cross was also used as a symbol of the Earth, encoding both the obliquity of the Earth’s axis of rotation and the "Cosmic Cone of 47 degrees as I later discovered. I found that in most traditional images of the Templar cross, the angle of the arms measure around 23.5º – being the same as the present obliquity of the Earth’s celestial pole. The angle of 23.5° turns up in many Alchemical drawings and mostly in the paintings from the Baroque period (17th century) – especially the Vanitas theme which I will comment on shortly and which was popular during this period; also paintings on the theme of Arcadia which include shepherds, tombs and skulls as well as paintings on the theme of St. Jerome and the skull (see Chapter Five) . . . and most consistently in the paintings of John the Baptist. There is a great mystery related to John the Baptist of that there is no doubt. 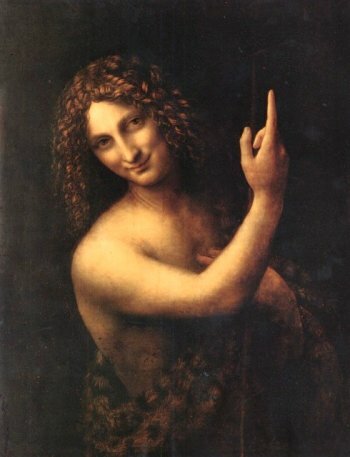 Interesting is the fact that in many of Leonardo Da Vinci’s paintings, we find reference to the ‘John gesture’ – the index finger pointing upwards. The phrase ‘John gesture’ was first coined by authors Lynn Picknett and Clive Prince in their book The Templar Revelation. Not all these paintings feature John making this sign, but many would agree that this is John’s signature. We find it in the famous mural, The Last Supper, (1595–1498), where Thomas (the origin of the phrase “doubting Thomas”) is thrusting an upright index finger at Christ. We find it in da Vinci’s first portrayal of John the Baptist, completed in 1516, who looks rather androgynous (male-female) and expressing the Mona Lisa smile. We also find it in his 1546 painting The Adoration of the Magi. Da Vinci was not the only artist to use this motif; we find it in paintings by Poussin for example, (see figure below), and also Raphael’s The School of Athens from 1510. However, what many of us have overlooked is that alongside the vertical-pointing index fingers, the index fingers in over 30 paintings of John the Baptist, painted between 1515 and 1717, are also pointing at the angle of 23.5 degrees! As far as I know, no one has noticed this particular phenomenon before. Below is a prime example – one of many. Figure 20: François I as John the Baptist, painted by Jean Clouet c. 1527. Musée du Louvre. Below are two more examples: St John the Baptist in the Desert by Titian (c. 1542) and the Crucifixion with John the Baptist and a Lamb by Matthias Grünewald (a.k.a. Mathis Gothart). 1515. In the latter we see John pointing at Jesus on the cross and at the angle of 23.5°, and above John’s pointing finger are the words: “He must increase, but I must decrease”. Figure 21: Left: St John the Baptist in the Desert by Titian (c. 1542). 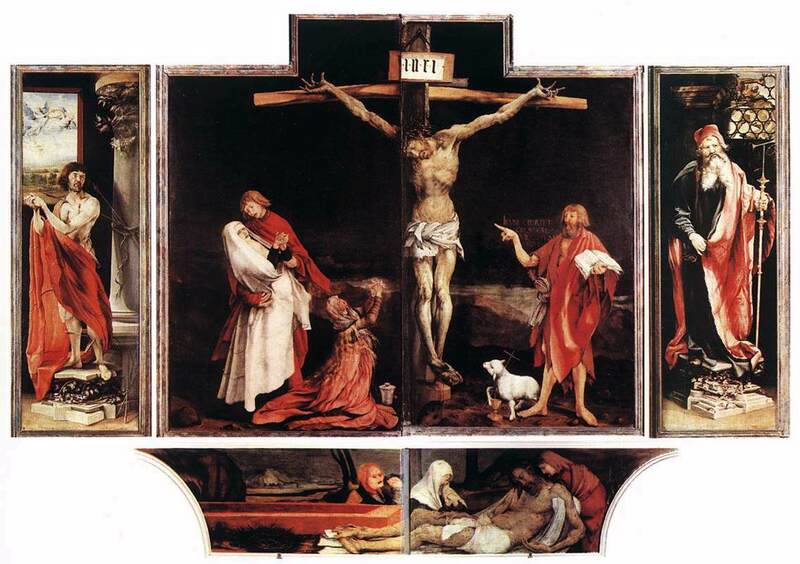 Right: Crucifixion with John the Baptist and a Lamb by Matthias Grünewald (a.k.a. Mathis Gothart). 1515. Figure 22: Left: St. John the Baptist by El Greco. (c. 1600). (Index finger of left hand pointing down at 23.5°, and index finger of right hand pointing at the same angle but perpendicular to the former). Right: St. John the Baptist by Jusepe de Ribera, (c. 1624). Note that the Reed Cross is perfectly straight as if also giving a reference to upright, zero obliquity. Again, I have personally found over 30 Baptist paintings that repeat this same motif, both apparent and subtle, and in a number of different ways. St John the Baptist by Caravaggio, (1604). (Large digit of Index finger of right hand, 23.5° – staff at 13° - tapering off at the bottom at 23.5°). Same title again by Caravaggio, (1610). (Index finger of left hand pointing downward at 23.5°). Same title by Nicolas Regnier, (1610). (Both index fingers at 23.5° - creating the precessional cone of 47°). Same title by Valentin de Boulogne, (1628–1630). (Index finger of left hand pointing upwards at 23.5°). St. John the Baptist By Baciccio, (1676). (Index finger of right hand pointing at 23.5°). Same title by François Le Moyne, (c. 1717). (Index finger of left hand pointing upwards at 23.5°). The Boy Baptist in the Desert by Raphael. (c. 1517). This is a peculiar example as the finger is pointing straight upwards. However, the reed cross at the base begins at the angle of 23.5 degrees; it then straightens out and ends vertically upright. Below is an interesting example by Paolo Veronese; St John the Baptist Preaching, (c. 1562), which clearly shows and quite conspicuously too, that this painting contains &apos;encoded information&apos;. As we can see, there are many references to the angle of 23.5 degrees: the trees along with the lay of the land, as well as the top half of John&apos;s body, are at this same angle and in contrast to the bottom half of his body - as expressed by his right leg - which is straight. He is also pointing straight downwards with the index finger of his left hand - again, referencing zero obliquity. Figure 23: St John the Baptist Preaching, by Paolo Veronese (c. 1562). 1.) An index finger pointing upwards, which has been overtly expressed and now generally acknowledged. 2.) An index finger pointing at 23.5 degrees, which has been subtly hidden and has remained that way until now. My own interpretation is that like the painting of Abraham and Isaac included above, this gives us two positions relating to the Earth’s axis of rotation: 1), upright . . . meaning zero obliquity, and 2), the 23.5° obliquity (tilt) angle the Earth’s axis is today. The most likely explanation for these 23.5° references in the majority of these Baptist paintings would be that the ‘Feast Day’ of the Baptist takes place on 24th June, close to the Summer Solstice – the day when the Sun is on the ‘Tropic of Cancer’ – latitude 23.5 degrees, North of the Equator – and this is a connection worth noting. John the Baptist was not only worshipped by the Templars, but he is also the patron saint of the Freemasons, and in Masonic lore John shares this trait with ‘John the Divine,’ also known as ‘John the Evangelist,’ whose ‘Feast Day’ takes place on 27th December, close to the Winter Solstice – the day when the sun is on the ‘Tropic of Capricorn’ – latitude 23.5 degrees, South of the Equator. The Tropic of Cancer and Tropic of Capricorn. The &apos;two Johns&apos; play the same role as the two opposite "Solstitial Lions" positioned above or around various temple entrances. Again, these two lions flank a central feature - such as the central pillar in figure 8, which represents the vertical, upright &apos;Pole of the Ecliptic&apos;, according to Frank C. Higgins, as well as the Equinoctial position of the Spring and Autumn Equinoxes. In terms of Duality, the two lions and the two Johns represent the dual, positive and negative, male and female opposites. However, emphasis is always placed on the central position - the Neutral Point between them as being most significant in terms of Truth and Balance and one&apos;s alignment with the spiritual Source. One would conclude that the artists responsible did not want to make it easy for us to find these references to the Earth&apos;s obliquity angle, and so one could say that they succeeded in keeping this particular motif in the St. John paintings a ‘trade’ secret amongst themselves, because again, the many references to this angle have remained hidden for hundreds of years – until now. Today we have computers that can quickly check each painting for this angle, and because the angle of 23.5 degrees is meaningfully significant – it being the tilt angle of the Earth’s axis at present – it only takes one discovery to trigger an enthusiastic search for the same encoded reference in the other paintings of St. John and from the same period. For instance, if someone had informed us that a reference to the angle of 23.5 degrees can be found in most paintings of John the Baptist between the 16th and 18th centuries, many of us would immediately examine the angle of the Reed Cross, which is one of the few items associated with St. John and therefore a regular feature in these paintings. But for the artists who have encoded these references, this would be too obvious. So, instead of using the reed cross, it was decided (a decision perhaps to which this “company of artists” complied) to paint the index finger of the Baptist at this angle. However, to keep this information hidden from the general public and the prying eyes of the Church, the artists also used every orientation – all eight directions of the 23.5-degree angle. Again, an interesting example is St John the Baptist Preaching, painted by Paolo Veronese, c. 1562. (See figure 21). We see John pointing back awkwardly at this angle with the index finger of his right hand while he is pointing straight down with the other. However, with him are two males and one of them has his hand behind his back, as one would hide crossed fingers when telling a lie; both index and second fingers pointing exactly at 23.5°. If the index finger had always been at the same orientation in these paintings, it would have been easy for people to notice this particular trait – especially those who were interested in this theme of the Baptist. Also, because many of these index fingers are pointing in all eight directions of this same angle, people would not have bothered to examine the angle of the index finger as it is always pointing at something which distracts our attention from the finger itself; whether the finger be pointing upwards to heaven, the sacrificial lamb, the reed cross or even Jesus Christ. The only painting that stands out in this regard is a Leonardo Da Vinci-related version, titled Bacchus: John in the Wilderness (c. 1517). See Figure 23 below. This painting was completed between 1510 and 1515 by an unknown follower of Da Vinci, based on a drawing by the great artist, inventor. The painting originally depicted John the Baptist. However, between the years 1683 and 1693, it was overpainted and altered, and given the title Bacchus. The 17th century artist who overpainted this work has clearly made a statement here that John is equatable with the Greek god Bacchus (IHS) who has been compared with Jesus, and who with other ‘resurrection gods’ like Dionysius, Aion, Adonis, Attis, Mithras and Tammuz, was based on the ancient Egyptian god Osiris. As we can see, John has his legs crossed. This also appears to be a reference to Osiris – and specifically the ‘X’ created by the Crook (heka) and Flail (nekhakha) which are held by Osiris as symbols of power with both crossed over his chest like the two opposite snakes or serpents held by the ancient Egyptian god of magic, Heka. The symbolic ‘crossed legs’ turns up in many esoteric sources – The Hanged Man of the Tarot, for example; a man who is &apos;enlightened&apos; while hanging upside down from the Tau Cross, with one leg bent and crossed over the other. The crossed legs signify the shamanic trance state (one&apos;s consciousness suspended within the hypnagogic, between the opposites - i.e., suspended within the &apos;NOW&apos; point, between waking and sleeping, day and night, past and future). In any case, when I first viewed the Bacchus painting by da Vinci, I was struck by the unusual way in which John points the index finger of his right hand. It’s obvious to many that this is a secret message of some kind – as are all these paintings that include pointing fingers, and what could be more obvious that what we are dealing with here is a code? But hardly anyone had brought attention to this particular oddity. The left index finger is pointing downwards and the finger is slightly bent at an angle of 6.5° from the vertical - a significant angle as we will see. Its a subtle detail which could be argued as being merely coincidental, but one that was intended in my view - having noted other correlating factors. The staff is 13 degrees which is 2 x 6.5°. However, if one were to examine the angle of the right index finger, one would find that it is not 23.5° as expected, but is exactly 30 degrees. 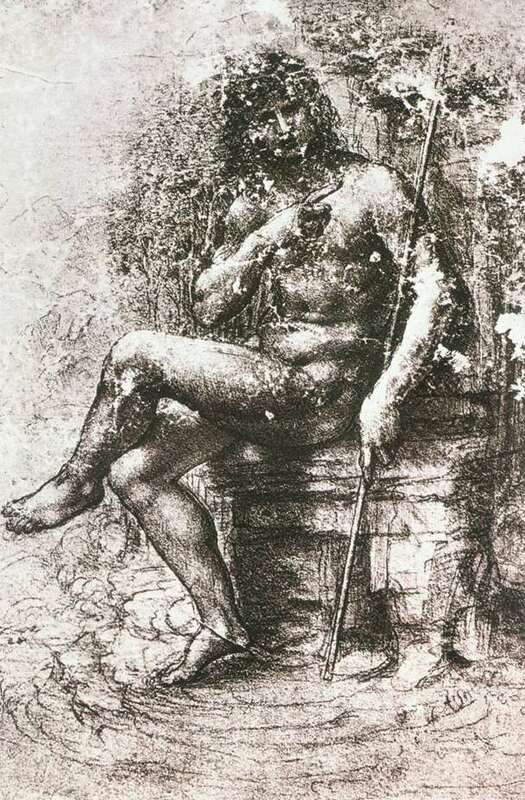 That the follower artist had intentionally placed the finger at this angle, is supported by the fact that in Da Vinci&apos;s chalk sketch study for this painting, titled Design for St John in the Wilderness (1508-1515) the finger is also at the angle of 30°. &apos;The overpainting transformed the image of St. John into one of a pagan deity, by converting the long-handled cross-like staff of the Baptist to a Bacchic thyrsus and adding a vine wreath. The fur robe is the legacy of John the Baptist, but has been overpainted with leopard-spots relating, like the wreath, to Bacchus, the Roman god of wine and intoxication&apos;. Figure 25: Bacchus: John in the Wilderness. Leonardo Da Vinci. c.1517. At first this was puzzling, especially after all this repetition of index fingers pointing at the Earth’s obliquity angle. It certainly stopped me in my tracks. The Da Vinci-related Bacchus/Baptist painting seemed to be the “joker in the pack”, and it is well known that Da Vinci was something of a “trickster”, who added all manner of strange things in his paintings. This 30-degree angle, as taken from Da Vinci&apos;s original sketch, is all the more puzzling when we look at another painting that portrays the very same code but in a slightly different way. This is Nicolas Poussin’s The Sacrament of Baptism, 1642. Again, it includes a man pointing straight upwards and a man pointing at the exact angle of 23.5°. Figure 26: Detail from The Sacrament of Baptism, Nicolas Poussin, 1642. The arm of the man pointing at 23.5° is also at this same angle, as are the shins of the men’s exposed legs in the foreground. Painting shins, arms, fingers and staffs at a specific angle appears to have been a favourite motif of Poussin’s and we find this in his other paintings – especially The Arcadian Shepherds, version II. In any case, what we see here is the same code, and it’s incredible that the same code should be carried over from the Renaissance era of Da Vinci to the Baroque period of Poussin. But why would Da Vinci present us with a different value? Why is the angle 30° instead of 23.5°? 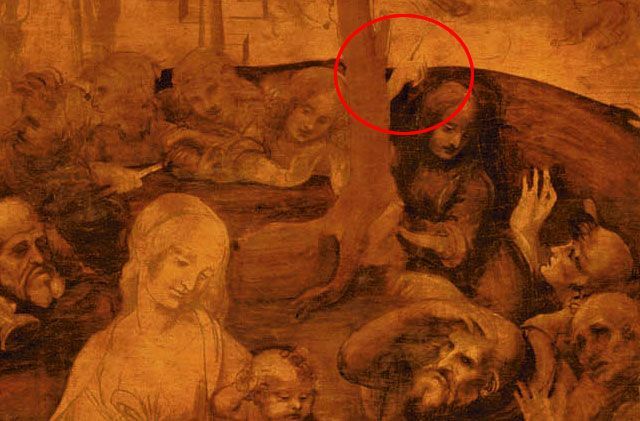 As a point of interest, the upward pointing finger belonging to the maiden next to the upright tree in the painting The Adoration of the Magi by Da Vinci, is not pointing straight upwards as is often referred, but really at the angle of 30°. However to the left we see a figure holding a linear object - a rod or stick - which is at the angle of 23.5°; and when we follow the line of the angle the stick is making, we find it ends at the base of the finger, showing a connection between the two and between these two angles. Figure 27: Detail from The Adoration of the Magi by Leonardo da Vinci (1481), and the angles of 30° and 23.5°. I soon discovered that Da Vinci’s paintings held more clues than realised because I found the same angles in Poussin’s first painting on the Arcadian Shepherds theme, Les Bergers d’Acardie version 1, (1627). The Shepherds are examining the inscription “ET IN ARCADIA EGO” on an inclined stone tomb or sarcophagus, and on top of the tomb is a skull. When measuring the angle of the tomb, using the neat, sharp edge of its lid, again we find it is exactly 30°. The staff of the shepherd in the middle provides us with a perfect perpendicular 30° angle . . . and the left edge of the tree, which appears to represent the Earth&apos;s axis, is a perfect 23.5°. The inclusion of these angles by Poussin was obviously intentional and for a reason, because it’s when we look at the sum difference between the two angles of 30° and 23.5° that we realise the significance here . . . 30° subtract 23.5° = 6.5° . . . and 6.5° happens to be the angle that John&apos;s finger is pointing at in the Bacchus painting. (See figure 23). The further we go on, we will discover that the angle of 6.5 degrees is another angle that has been found in numerous paintings and sources, and I would ask that those readers, who have not yet read the book I co-authored with Scott Creighton, The Giza Prophecy, remember these particular values - i.e., 30°, 23.5° and 6.5° - as their relationship will prove important later when we see how the Great Pyramid of Giza fits into all this and how it brings everything together, as everything we have seen so far in this presentation and more to come, is ulimately leading us to it. The obviously encoded, 30°-angle relationship between this first Shepherds painting by Poussin and the Bacchus painting based on Da Vinci&apos;s sketch - first painted 110 years earlier and overpainted some 60 years after Poussin&apos;s painting - is something we will have to return to later - suffice to say that the answer to this particular conundrum appears to be a ‘key element’ of this whole mystery. As mentioned, the Thyrsus Staff in the Bacchus/Baptist painting is at the angle of 13° – 2 x 6.5°. What is particularly interesting about this particular angle of 13° is that it is also included in the painting The School of Athens, where we see Plato walking alongside Aristotle, his pupil. Both men are carrying leather bound copies of Plato’s work Timaeus and Critias, which contain Plato’s discourses on Atlantis as well as the global catastrophe that supposedly destroyed and sank Atlantis. From their hand gestures they are obviously discussing something – most likely something relating to Plato’s work. However, the artist Raphael has decided to paint Plato in the likeness and appearance of Leonardo da Vinci, and interesting is the fact that da Vinci as Plato is pointing upwards – the upright “John Gesture”. This example of the ‘gesture’ is often referred to as upright, but in this painting the angle of the index finger is exactly 13°. It appears that no-one has bothered to actually measure the angles of the fingers and have therefore completely overlooked the fact that the key to the code in these paintings are the angles of the features themselves – completely overlooking these recurring angles and the important fact that the artists were indeed conveying a message through them. We will look at why the angle of 13° is also important later. The authors of The Templar Revelation, Picknett and Prince, also examined several of Da Vinci’s paintings for clues – these being the two versions of Madonna of the Rocks (1483-1486, 1495-1508) and a mural, The Last Supper, where again to the right of Jesus, Thomas is pointing upwards, making the “John Gesture”. The authors also cite Mary Magdalene in Da Vinci’s The Last Supper, of which more will be said later, and we find that the Magdalene theme was also a favourite with these ‘angle encoders’. Figure 28: Les Bergers d’Acardie version 1 by Nicolas Poussin, (1627), and the angles of 30° and 23.5°. There are many paintings of Mary Magdalene with a skull and a large Crucifix, and she is often shown holding the Crucifix at the angle of either, 23° or 23.5 degrees. Figure 29: Maria Maddalena in Contemplazioni del Crocifisso (1936) by Rovigo Palazzo Roverella. In some examples a book is included that will either be placed at one of these angles or leaning open at one of these angles. We also find that trees, the lay of the land or huge slabs of rock, as in the sketch La Maddalena del Batoni by Carlo Naya (1816-1882), are at the Earth’s obliquity angle. In the painting La Magdalena, Lorca, Casa de Guevara by Pedro Camacho Felizes (1694), the crucifix is leaning at 23.5. In the painting Maria Maddalena in Penitenza (1822) (artist unknown), we see the Magdelene laying before the crucifix at 23°. In the painting Repenting Magdalene by Georges de La Tour (1593–1652), Mary is holding the Crucifix at the angle of 23.5°. And finally in the painting Noli Me Tangere by Correggio (c. 1522-1525), Jesus appears to Mary Magdalene, and like John the Baptist his index finger is pointing upwards at the angle of 23.5°. Also the long handle of a shovel next to his left leg is at the same angle precisely. As we know, “a picture paints a thousand words” and so in attempting to understand the significance of the anomalous images and cryptic messages that appear to have been purposefully added into the paintings by Da Vinci and others, authors Picknett and Prince concluded that there is a “thread of heresy” that reaches back over 2000 years, and that the true story of the relationship between Jesus, John and Mary had been suppressed by the Roman Catholic Church. As we have seen, also weaved within this “thread of heresy” are these angle references to the angle of 23.5 degrees, which these authors and others have missed and which are somehow associated, and considered no less heretical so it would appear. We have seen how John the Baptist is associated with this angle via his ‘Feast Day’ that takes place on the Summer Solstice and when the declination of the sun reaches 23.5°. But this is only a cursory explanation or reason as to why this angle exists in the Baptist paintings. It doesn’t explain why he is associated with the Summer Solstice and why his counterpart John the Evangelist is associated with the Winter Solstice, and neither does it shed light on why this angle is encoded in so many other sources that appear to have nothing to do with the Baptist. So now it is at this point that we may ask, ‘why’ is the Earth’s inclined axis being referenced in all these sources? After all, some believe and are of the opinion, that the tilt of the Earth’s axis is a ‘natural phenomenon’ and that the 23.5º tilt is necessary as the summer and winter cycles govern life on our planet. But, if this is true, then why do we find references to the angle of 23.5º in paintings on the theme of death, battle, war and conflict as well as enlightenment? What exactly did the ‘initiate’ artists know – those who gave reference to this angle? What great secret was being communicated here between these initiates? Well discovering the answer to this is one of the more interesting and fascinating elements to emerge from these discoveries and this research. Figure 30: Left: La Magdalena, Lorca, Casa de Guevara by Pedro Camacho Felizes (1694). Right: Repenting Magdalene by Georges de La Tour (1593–1652). Figure 31: Left: Noli Me Tangere by Correggio (c. 1522-1525). Right: St. John the Baptist in Ecstacy. (Painter unknown). This is a rare example of the reed cross at the angle of 23.5 degrees. These subtle references to the tilt angle of the Earth in ancient art have not been acknowledged in the mainstream but are indeed important in our understanding of the ancient cultures who encoded them, as myself and others like Frank C. Higgins have discovered and acknowledged. While researching into this subject it becomes clear that a very long time ago there were people who possessed an advanced geophysical knowledge of our planet and long before the weighty dogma of irrational beliefs had been laid down by the Church, forcing a large percentage of humanity into a ‘Dark Age’ of ignorance. The Catholic Church was very powerful during the so-called ‘Dark Ages’ as well as the ‘Middle Ages’ – and really until the dawning of Science and the so-called ‘Age of Enlightenment’ – so to be branded a heretic was very dangerous to one’s health. Those who understood the wisdom of the ancients and knew certain truths about the origins or Christianity – information which could undermine the Church – would have had to be seen to “toe the line” and so knowledge, which would have been seen as “heretical” and otherwise suppressed and stamped-out by the Church, would have been encoded – not only to preserve this knowledge, but also to secretly pass it onto others. The religious persecutions made by the Church which increased between the 15th and 16th centuries culminated in the trial and execution of philosopher Giordano Bruno in Rome in 1600, who was burned at the stake for publically spreading his own ‘infinite’ cosmology of the universe and his own mixed brand of Neo-Platonism and Renaissance Hermetical science. The savage execution of Bruno sent a shock wave throughout Europe . . . the message was clear: “Heretics would not be tolerated”. It’s no wonder then that we find more paintings with these angle references dating from the 1600s than any other period in history. Many philosophers, artists, occultists and men of science, were forced “underground”, and so as a way of communicating with each other using symbolism and other means, ancient knowledge and wisdom, as well as the most recent scientific discoveries, were encoded in various sources to preserve it for future generations. Giving some reference to this knowledge by encoding it, also served as ‘a voice’ for these people – many of them geniuses, who must have felt frustrated knowing things that were closer to the truth but which they could not openly express for fear of attracting the wrong kind of attention and the severest forms of punishment. Having to encode this knowledge presented a paradox in which these people often walked a knife edge. Most no doubt had a vain wish in declaring their genius and their depth of knowledge and on things that could possibly change the world, but knowing that at the same time they had to conceal it, painfully dashed any personal desire associated with the imagined good fortune and public recognition, which in an ideal world would arrive naturally with the acceptance of paradigm-changing discoveries. Aside from the use of ‘symbolism’, which has been used since ‘time immemorial’, the ideal medium for any code or cipher, and without it being obvious that one has encoded information, is the Arts. After all, to some extent, one has artistic licence to use any imagery one likes in the composition. It’s no surprise then to find that many architectural buildings, sculptures – especially illustrations and paintings – contain codes . . . and often the same code as I myself and others have discovered. Beginning with the darkest kind – i.e., common blasphemies at the time, like Satanism, witchcraft, magic – leading on up to the kinds of heresies associated with diverse religious views, philosophies, beliefs and other faiths such as Catharism and of course Islam, which always threatened Christian Europe – are one thing . . . but what was it exactly that the Church had against the new pioneers of science? The doctrine espoused by the Church was the ‘Concentric’ or Geocentric view offered by Claudius Ptolemy (100–165? AD), that all heavenly bodies – including the Sun – revolved around the Earth. The Earth was the centre of all creation; each body was fixed upon a series of rotating celestial spheres, and according to God’s plan, the Earth was perfectly stable, did not rotate and was therefore ‘upright’ and in every way we would use the term. Figure 32: The Ptolemaic Cosmological System. The Planets and Sun are shown moving around the Earth which is at the centre. The Universe is divided into eight concentric spherical shells – one for each of the seven planets and one for all the fixed stars. The sphere of stars was seen to rotate daily around the motionless Earth. Being burdened with this sort of blind ignorance we can see why people also continued to believe the Earth was flat – and this hundreds of years after the ancients - especially the hierophants and adept priests of the scientifically more advanced cultures of Chaldea, ancient Egypt and India, had known it all correctly the first time. As we can see, there’s no doubt whatsoever, that part of the answer as regards these encoded references to the Earth’s obliquity angle and mostly between the 15th and 18th centuries, is associated with the staunch celestial beliefs that were promulgated by the Church and which were later reinforced and with such ferocity in the face of the emerging alternative views that began with the Reformation in the 1500s, and the re-discovery of ancient Greek manuscripts which had been preserved and brought over from the East. For example, a Greek philosopher of the Pythagorean school, Philolaus (c. 480–385 BCE), described an astronomical system in which the celestial bodies all revolved about a central fire. Then there’s the Greek philosopher and astronomer Heraclides Ponticus (387–312 BCE), who proposed that the Earth rotated on its axis. And finally, we have the Greek astronomer and mathematician Aristarchus of Samos (310 – ca. 230 BC), who presented the first known heliocentric model of the solar system; his hypothesis was that the fixed stars and the sun remained motionless, that the Earth revolves about the sun in the circumference of a circle, and that the Earth rotates about its axis every 24 hours. Also we should not be naive in thinking that the ancients didn’t know the Earth was tilted at around 23 degrees. Long before the Greeks, the earliest astronomers had managed to calculate the tilt of the Earth by measuring the shadows cast by a simple stick, or indeed obelisks and pillars, as was used originally by the ancient Egyptians to determine these facts about the Earth – information and knowledge that was also jealously guarded by many of these ‘astronomer priests’ and hierophants. Not only was the Earth’s obliquity calculated through using this technique, of which more will be said later, but also the whole circumference of the Earth could be calculated as the Greek astronomer and mathematician Eratosthenes had discovered. Anyway, these and the new scientific discoveries that were being made with the arrival of the Greek manuscripts, all led to the Renaissance, and it was during this time that the persecutions made by the Church were in full swing to stamp out the “heretical beliefs” that threatened its authority. However, in the wake of these persecutions, some were bold enough to publish knowledge of the tilted Earth and as early as the late 17th century. For example, the English poet, John Milton gave vague reference to the tilt (obliquity) of the celestial polar axis in his famous work, Paradise Lost, written sixty five years after Bruno was executed – as did Thomas Burnet in his Telluris Theoria Sacra, (The Sacred Theory of the Earth) – written in 1681. And we can see how the ideas of Aristarchus were taken up again some 1800 years later: first by Copernicus, whose book De revolutionibus orbium coelestium (On the Revolutions of the Celestial Spheres) was completed in 1543 and just before he died, and developed further by Johannes Kepler and Isaac Newton, when these persecutions by the Church began to wane. So what we have seen so far in the chapter, is perhaps a glimpse into the minds of those who defied the wrong and staunchly-defended views of the Church, and who were active as part of a secret ‘covert resistance’ against the Church, by also ‘encoding’ the tilt angle of the Earth in many different sources, thereby bringing to light the true condition of the Earth and its place in the universe for those who had the eyes to see it and all in accord with the knowledge and wisdom of the ancients. Looking again at the two “gestures” attributed to John the Baptist, perhaps both are related to the two opposing beliefs, as in A), a centralised and upright Earth as believed by the Church and its flock on one hand (0°), and B), the true facts about the Earth on the other (23.5°). In some of these paintings in which both directions are given like Poussin’s The Sacrament of Baptism for example (see figure 24), it’s as if the person who is pointing at the angle of 23.5 degrees is telling the person who is pointing upwards that he is deluding himself, “No, no, no . . . the Earth is not upright, it is tilted and at the angle of 23.5°!”. These are all logically derived observations and interesting connections, but there may be more to this belief in an ‘upright Earth’ than we realise, because the upright pointing finger, showing the way to God, is still an attractive and logical explanation and one which points to the source of the whole mystery, and this will soon become evident the further we go on. In any case, what comes to mind when viewing the many sources in which this angle is evident, is that these angle references reveal the truly heretical truth that God’s plan is not perfect; that the tilt of the Earth which was seen as unnatural also indicates that the fate of the Earth is uncertain and that its tilted condition may be the result of a global cataclysm in the past. This of course means that rather than the Earth being a superlative example of God’s creation in which ‘certainty’ and ‘order’ reign and are maintained throughout the universe, that on the contrary, this imperfect image of a ‘skewed’ Earth in orbit around the Sun reveals our planet has an inferior position in the universe and in God’s plan; that it is also vulnerable to ‘uncertainty’ and ‘chaos’ and is therefore prey to the random wanderings of smaller celestial bodies and any series or periodic cycles involving natural cataclysms that may befall it. In Tallinn’s Dance of Death, (figure 11) we can gather that the ‘Man of the Church’ standing upright is under a delusion, because the Earth is not perfect – hence the dead who are shown dancing around him with their limbs of at the angle of the Earth’s obliquity, indicating that the angle of 23° or 23.5° is associated with negativity, destruction and death. There’s no denying that even today the number ‘23’ has some occult significance – a fact we will also be examining later. In any case, one would be forgiven for suggesting that perhaps some past catastrophic event had caused the tilt in the first place. But what makes this particular theory convincing, is that these angle references and what they appear to be conveying, is in stark contrast to the views of the Church which were being enforced at the time when many of these angles were also being added into paintings on certain religious themes; and it is this that reveals both the motive and the reason why these references were subtly added and secretly encoded. Ironically, we find these codes in paintings that had even been commissioned by elite members of the Catholic Church – many of them unaware that they had been patron to ‘heretic initiates’. No doubt many of these initiates had infiltrated the Vatican and were behind a good number of these commissions, benefactions and investments in art, sculpture and architecture. Whatever the reason, it appears that the encoding of these specific angles associated with the Earth’s geophysics has largely been a tradition with artists and for hundreds of years, because I have found that even today there are artists who appear to be encoding the same angle(s) in their works even though the Church and the Inquisition are no longer active. One can only conclude from the sheer volume of the references we find to this angle, that the people behind them – artists especially – belonged to a secret fraternity spanning many generations. If having been passed down by tradition, it’s likely that these angles were used by artists who were initiated into the meaning behind them. The initiate artists who encoded these angles in their paintings, sketches, woodcuts and other works of art are numerous, and they include Raphael, Da Vinci, Poussin, Tenniers, Heironymous Bosch and also Albrecht Dürer – and really the list goes on and right up to the present day. But it’s also fair to say – and because of the sheer volume of paintings I have found with references to the Earth’s obliquity angle of 23.5° – that many artists may have just been following tradition, not really knowing the real meaning as to why they should paint swords, spears, trees, staffs, limbs, bones and other linear objects at this same angle and this is nowhere more apparent than in the next theme. In art there is a style or form of expression especially popular in Europe during the 17th century known as Vanitas – meaning ‘emptiness’ or ‘untruth’, from which we derive the English word ‘vanity’. These compositions are usually ‘still life’ images or genre subjects with the objects symbolising the fragile transience of life. They mostly always feature a human skull, arm and thigh bones, antiquarian books, swords, candles, musical instruments and musical scores, flowers, large spiralled shells, an hourglass, and other paraphernalia arranged somewhat haphazardly on a table or large ornate chair. Sometimes floating bubbles are included to again give reference to the transience, brief life-span and fragility of human life. Skulls are also an endemic feature in many of the 17th century paintings on the “ET IN ARCADIA” theme – again those by the painter Nicolas Poussin and also the painter Guercino (1618–1622). Often we will find a musical instrument or a book, perhaps a thigh bone or knife at the angle of 23°. Figure 33: Vanité by Simon Renard de Saint-André, Musée des Beaux-Arts de Lyon. 1677. Recorder at 23.5° (There are other significant angles in this painting). 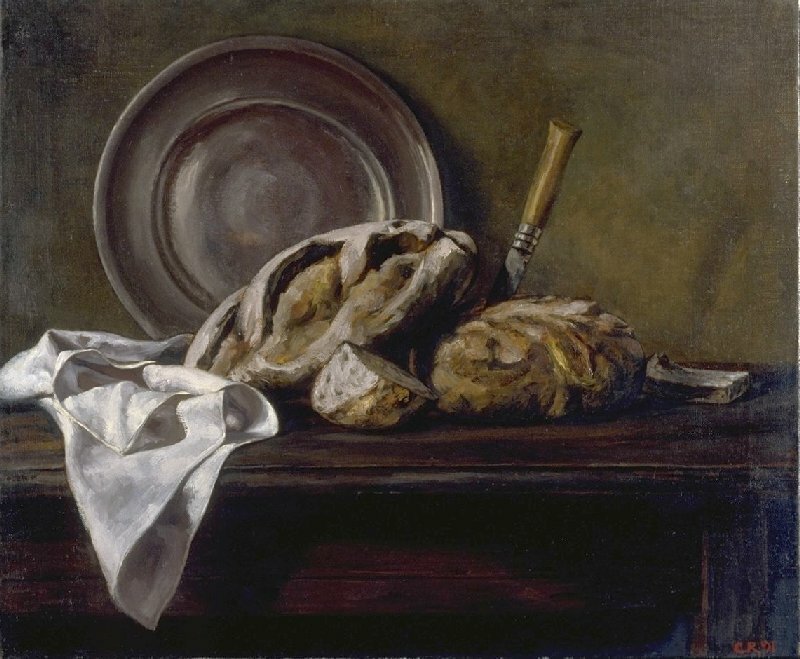 With a little more scrutiny we discover that in many of these paintings there are several references to the same angle – repeated over and over again with numerous objects – some subtle, like the edge of a table for example, or two or three objects placed in such a way that when you draw a line connecting each object you will discover that the angle is again 23.5°, or some other significant related angle which I will introduce shortly. The best examples I have found so far in which this angle is predictably and tiresomely repetitive, are the Vanitas by 17th century Dutch painters, David Bailly (1584–1657), Vincent van der Vinne Laurensz (1629-1702) and Evert (or Edwaert) Collier, born between 1630 and 1650, d. 1708. Figure 34: Left: Vanitas by Edwaert Collier, 1662. Right: Vanitas by Edwaert Collier, 1693. Skull, book and paper notes, all leaning at the angle of 23.5 degrees. Taking another example: in Collier’s Vanitas: (undated), we find seven items at this same angle. Some of these paintings even present undeniable proof that the artist intently encoded this angle; in that the only items on display have each been painted at the angle of 23.5°. A fascinating example of this is by artist Fra Giovanni da Verona, titled Intarsia (1503-1505), in which the open doors of a cupboard reveal two shawms and two flared-bell recorders hanging inside, each positioned at different orientations of this same angle. Nothing could be more obvious than this that what we are today now seeing in these paintings is additional or ‘loaded information’ and therefore a code or message of some kind. Aside from my own findings of the many references to this angle in paintings and other sources, I repeat that I have also been sent hundreds of examples from people who have discovered these ‘Earth-obliquity’ angle references for themselves and so despite the sheer volume of evidence at my disposal, I can really only touch on the many examples I have examined. And finally on this theme, there exists a huge collection of Vanitas paintings by contemporary artist Elsie Russell dating from the early 1990s in which the angle of 23.5° has been referenced repeatedly and more clearly with only one or two linear items – each being the central focus of the painting and all at this angle. Bread, Knife and Cloth. (1991). 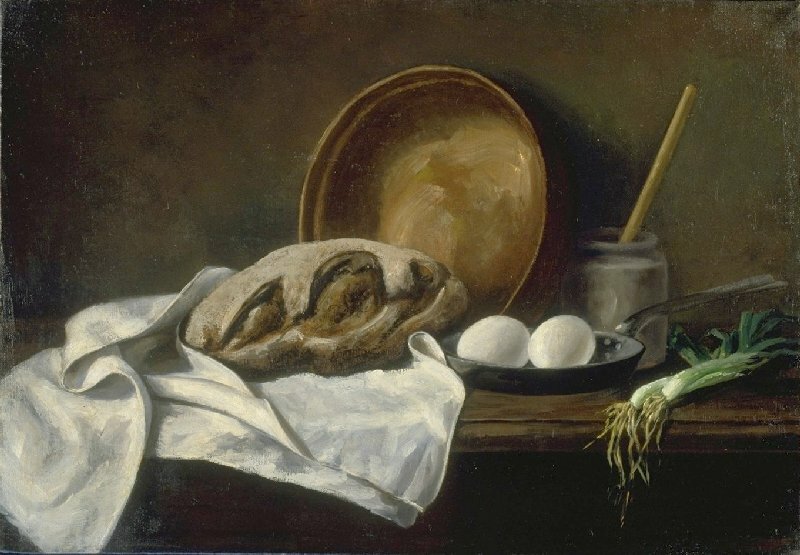 Kitchen Still Life with Bread and Eggs. (1993). 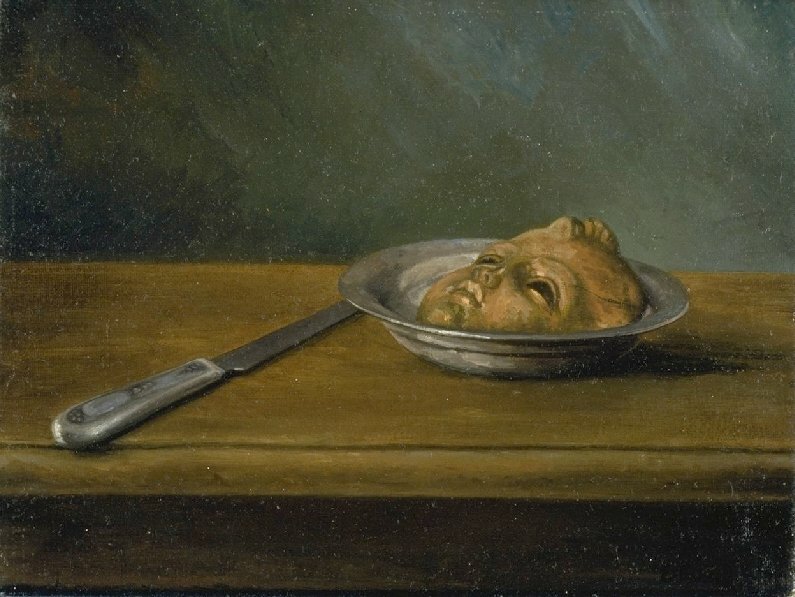 In any case, I think these particular paintings provide good evidence that the Vanitas paintings were purposefully and intently encoded with this angle and that this was a tradition amongst artists. In other words, seeing as the angle has been so obviously applied or encoded in these contemporary Vanitas paintings then it stands to reason that this same angle in the Vanitas paintings from the 17th century was also purposefully encoded. Seeing as today the Church is no longer a threat, it would appear that Elsie Russell has merely been following this same tradition, if we can call it that. There may be another answer as to why the tradition to encode this angle has carried on to the present; one that may be associated with an alternative view of the geophysical history of this planet, and one that ironically, is now at odds with the established beliefs of the present “world religion” that has now gained some ascendancy over the power and influence of the Church . . . the institution of Science. 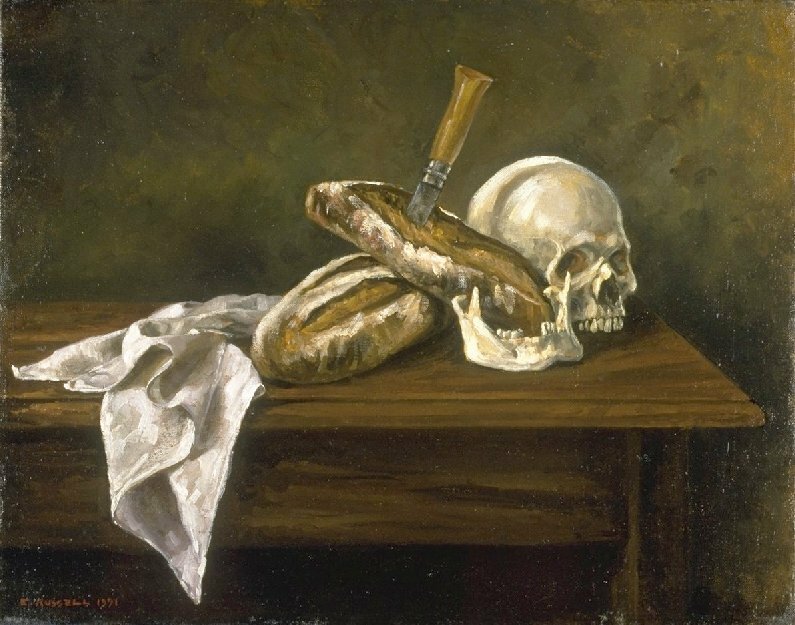 Figure 35: Four late 20th century Vanitas paintings by artist Elsie Russell. 1. These 23.5-degree references were first discovered by myself in 2001. It appears that I am perhaps the first and only person to discover these angle references, and bring them to public attention since Frank C. Higgins first presented those he had discovered in his books Ancient Freemasonry (1919), and which had inspired some study into the origins of Freemasonry during the early 1900s. The research is still ongoing and more are being discovered everyday and also by others interested in the phenomenon - some of whom have emailed me their findings. 2. See: Osiris and the Egyptian Resurrection ,Vol 1. Sir Ernest Alfred Thompson Wallis Budge. (Dover Books, 1973; originally published in 1911 by The Medici Society Ltd). 3. In a discussion on the subject of the Djed Pillar, investigative journalist and author Filip Coppens pointed out to me his view that: “The Djed also symbolised the Nile – the “natural meridian” of Gizeh, also seen as Osiris’ spine”. In Figure 2 (see previous page, The Earth&apos;s Geophysics), I made a point of placing the map of the Earth so that the Axis also represents the Prime Meridian believed by many to have originally run through Giza, aligning with the River Nile, the longest river in the world, and also marked by the Great Pyramid. 4. This observation that the angle of the tilted Djed at the Temple of Abydos was close to the Earth&apos;s obliquity angle, was first mentioned in Catastrophobia: The Truth Behind Earth Changes in the Coming Age of Light. Barbara Hand Clow. (Bear & Company; annotated edition May 1, 2001). 5. Source: Star Maps: Astounding new evidence from ancient civilisations and modern scientific research of man&apos;s origins and return to the stars by William R. Fix, (Johnathan-James Books, Canada and Octopus Books, London. Printed in the USA. Editor R. Carolyn King. 1979). p. 32. 7. Source: Myth and Symbol in Ancient Egypt. Robert Thomas Rundle Clark (Thames & Hudson 1959). 9. I would like to thank Pete Reston for bringing the work of Frank C. Higgins to my attention. Pete noted the many references to the angles of 23.5 and 52 degrees in the books of Frank C. Higgins after reading my articles about the discovery of these angles in paintings and other sources. The information given in Higgins’ books based on the secrets of Freemasonry, which in turn are based on ancient wisdom and knowledge, is supportive of my own discoveries, and is evidence, if not proof that the references to these angles were deliberately placed in various sources and not ‘coincidental’ or apothenia on my part as some pseudosceptics have claimed so as to debunk my work. 10. Source: Ancient Freemasonry: An Introduction to Masonic Archeology, Frank C. Higgins. (First published 1919). p. 10. 11. Source: Initiation, The Meaning of, by Bro. Frank C. Higgins, New York. (The Builder July 1916). 12. Source: Ancient Freemasonry: An Introduction to Masonic Archeology, Frank C. Higgins. (First published 1919). p. 30. The “staff” is not at 23.5 degrees as Andy suggested but is closer to 23 degrees, as we would come to expect from art of this earlier period. 15. Source: Ancient Freemasonry: An Introduction to Masonic Archeology, Frank C. Higgins. (First published 1919). p. 50. 16. Ibid. pp. 50 – 52. 17. See: Professor G. J. Toomer. “Hipparchus and Babylonian Astronomy” in A Scientific Humanist: Studies in Memory of Abraham Sachs, edited by Erle Leichty, Maria deJ. Ellis, and Pamela Gerardi, 353-365. Occasional Publications of the Samuel Noah Kramer Fund 9. Philadelphia 1988. 18. Quote from Apocalypse: Wikipedia the free Encyclopedia. 19: Source: The Grandmasters Seal: Mary Leinhart’s Dissertation. Mary Adelle Leinart, 2004. Department of Archaeology and Prehistory University of Sheffield, England. “By history, custom, tradition and ritualistic requirements, the Craft holds in veneration the Festival Days of St. John the Baptist on June 24th, and St. John the Evangelist on December 27th. Any Blue Lodge that forgets either of these important Festival Days forfeits a precious link with the past and loses an opportunity for the renewal of allegiance to everything in Freemasonry symbolized by these Patron Saints”. “St. John’s the Baptist&apos;s Day, June 24th, marks the summer solstice, when nature attains the zenith of light and life and joy. St. John’s the Evangelist’s, December 27th, symbolizes the turn of the sun’s farthest journey, which is symbolic of the attainment of wisdom, the rewards of a well-spent life, and goodwill toward men”. 21. Wikipedia: Bacchus: John the Baptist in the Wilderness. 22. Arktos: Polar Myth in Science, Symbolism and Nazi Survival by Joscelyn Godwin. (New Leaf Distribution Company; New edition, Dec 1996). Originally published in 1993. p. 182. “Where did the Greek philosophers get such ideas? Probably from the scientifically more-advanced cultures of Chaldea and Egypt”. 23. Ancient Freemasonry: An Introduction to Masonic Archeology, Frank C. Higgins. (First published 1919). p. 381. “A great number of those wonderful Greek scientists, who gave forth such mighty discoveries from Alexandria thus appear to have been merely offering as their own work that of the Egyptian, Chaldean and Hindoo masters, who had preceded them, a proceeding which none will recognize as having been either good, square or true on their parts”. 24. During December 2010, and unable to correspond with the artist Elsie Russell directly, I sent an email to Elsie Russell’s assistant asking why Elsie had referenced the angle of 23.5 degrees (obliquity of Earth’s axis) and also 52 degrees, so repetitiously in many of her Vanitas paintings. I thought this was rather an evasive answer, as one would be extremely lucky to paint objects at exactly 23.5 degrees in several paintings and by chance. I would ask that the reader look closely again at the four paintings above by Elsie Russell (see figure 35), and be his or her own judge. Regaarding the angle of 30 degrees. It is that portion of the sky assigned to each constellation of the zodiac. Each of the 12 zodiacal constellation covers 30 degrees of arc across the 360 degree belt of the zodiac. Another clue regarding precession I think. Sorry if you mentioned that and i missed it. Thanks. I have read many articles with reference to the 23.5 tilt angle ,but the well researched articles that you have presented here is highly commendable. Many thanks for the same and keep up the good work. Your discoveries are commendable. I can&apos;t wait to read your book "The Giza Prophecy", which is ordered and should be at the post office ready for pick-up. I&apos;m not sure what you imply here except for the fact that certain knowledgeable people withheld information for fear of their lives. Heresy was intolerable by the Church, but the Church itself was founded on the exploitation of truth to begin with and was actually a means to control the masses and keep the Roman Empire intact. I wouldn&apos;t be surprised if Davinci et. al. were privy to the things that the Church already knew, but didn&apos;t want to make public. Rome exploited Christianity and put a Pagan spin on it to appease the largely Pagan region. They began to kill the "heretics", who were really the holders of the most essential teachings of Christ. I&apos;m sure I&apos;ll get a better feel for your conclusions as you post more here on the site. In one instance, I notice a subtle suggestion that the world is not perfect because God&apos;s plan was not perfect: "...is that these angle references reveal the truly heretical truth that God’s plan is not perfect; that the tilt of the Earth which was seen as unnatural also indicates that the fate of the Earth is uncertain and that its tilted condition may be the result of a global cataclysm in the past...."
I&apos;m not sure if you read my book, but the cataclysmic event, which destroyed the civilization preceding us by more than 4 million years, was caused by man&apos;s discovery and misuse of Absolute Knowledge. Absolute knowledge is Absolute Power or the Power of Truth, which is constantly shaping events and experiences to reveal the errors in our beliefs. Rather than go into a long explanation here, the human view of causality is often ego-centric and fails to see the underlying forces, which I call the Metaphysics of Truth. In the end--the Omega, which is totality in understanding, returns and is reflected in a perfect and harmonious physical world.